"Portable suite of security utilities you might appreciate"
It’s a known fact a simple antivirus program is no longer sufficient to protect your computer against the variety of security threats trying to infect your system. 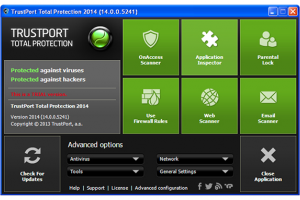 Be it malware, virus, trojan, or others, you need a more complete solution. Now, as you reached this page and are reading this article, you’re probably aware of this and as such you might be interested in the dedicated product presented here, called TrustPort Total Protection. It’s a computer security suite, encompassing antivirus, firewall, parental control, encryption tools and a secure file destroyer. Modules can be easily enabled and switched off and configured according to your needs. If interested in finding out more details about TrustPort Total Protection’s features, consider proceeding to the download to see if it suits your needs.